Our garage door model 399 has the strength of steel and a long panel simulated wood grain embossment to enhance the appearance of your door. The polystyrene insulation provides a 9.8 R-value for a more comfortable garage and a steel backing for security and a finished appearance. 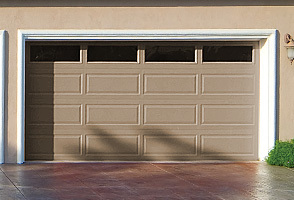 A lifetime limited warranty on these steel garage doors means it is made to last. A wide variety of standard and premium window options are also available for these steel garage doors.